Who Is Killing Doctors And Why? 7 Dead, Multiple Missing Doctors And A Possible Cover-up On 3 Supposedly Found Dead In Mexico! First credit where it is due, Erin Elizabeth and Deborah Dupre have both done excellent work on the recent slew of dead and missing doctors, providing possible links to Florida and to the hot button issue of vaccines. Starting with the dead holistic doctors because the missing doctors and the possible coverup by the Mexican authorities is a twisting tale one would expect to see in a murder mystery on television. Lisa Riley DO was found in her home with a gunshot wound to her head on July 1oth, 2015. 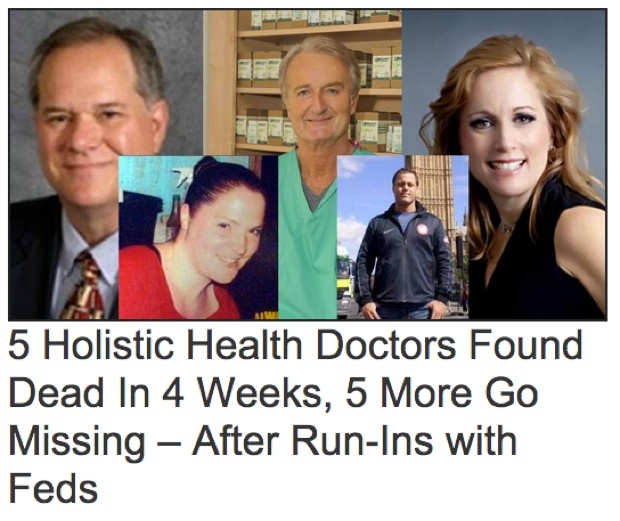 Two doctors are officially listed as missing, we will detail those cases, but unofficially, according to Erin Elizabeth of Health Nut News who has been documenting each of these cases, the number is actually five. The two officially missing are Dr. Patrick J. Fitzpatrick who is a 74-year-old North Dakota Doctor, who went missing in neighboring Montana. His vehicle and trailer were found abandoned next to a pea field Saturday south of Willow Creek, near Three Forks, according to NBC News. The second missing doctor is Dr. Jeffrey Whiteside MD who vanished without a trace while on a family outing in Wisconsin. Here is where there has been some confusion. Health Nut News headlined on July 21, 2015 with "MD Found Murdered inside Florida Home Today. This makes 6 in 30 days, 5 still missing," but on the surface it appears there are only two doctors missing, unless you follow all the links and factor in the very strange disappearance of three others in Mexico, which reportedly were found dead, but which family members believe a coverup is taking place as I will explain below. According to Mexican prosecutors four bodies were discovered on June 19, 2015 in the southern Mexico state of Guerrero. Guerrero state prosecutors said Sunday that DNA tests had matched the bodies with three doctors and a lawyer who had been reported missing earlier in the month. Key quote in the NZ Herald article about this case is "The missing men's families have said they don't believe the bodies are those of their relatives." Anyone familiar with the stages of grief would know that denial is part of the process, but other information detailed in the above linked article appears to give credence to the families' claims. Perhaps the most compelling reason to believe there is some type of coverup going on is the account of one of those familiy members who is very familiar with the appearance of dead bodies because he is defense lawyer in Acapulco. His name is Omar Hernandez, he is the cousin of one of the missing or dead doctors and he states "I look at deceased people in the morgue all the time, and the corpses [the DA] showed us had clearly been dead for weeks. But Marvin and the others were only missing for a few days." Read more at Health Nut News. Doctors are dropping like flies, holistic doctors which some have connected to anti-vaccine leanings and many of them have been found in or close to Florida. Leaving the question of who is killing the doctors and why? Dead Doctors: Now 8 Dead And Disappeared - Are Medicine's Finest Being Assassinated? The Shocking Links!